Samsung Galaxy S7 was among the first devices to be updated to a newer Android 7.0 Nougat firmware build. The Verizon US carrier has been rolling out a similar Nougat OTA to the Samsung Galaxy S7 SM-G930V and the S7 Edge SM-G935V variants. The OAT updates from the official Beta program have been captured and available for download. The update procedure for the Verizon device is pretty simple. No root required. However, the device must be on the complete stock firmware. Unlike the international variants of Samsung devices, the US carrier bound devices, mostly, do not come with a full firmware file. Even though they do come as Odin flashable stock firmware files, but they are too rare and outdated. Hence, the only way to update Verizon, AT&T, Sprint variants of Samsung is via OTA updates. The captured OTA zip are readily flashable via stock recovery. Update: The new G935VVRU4BQA2 and G935VVRU4BQA2 firmware build for verizon S7 & S7 Edge based on NRD90M is now live on Verizon carrier support page. 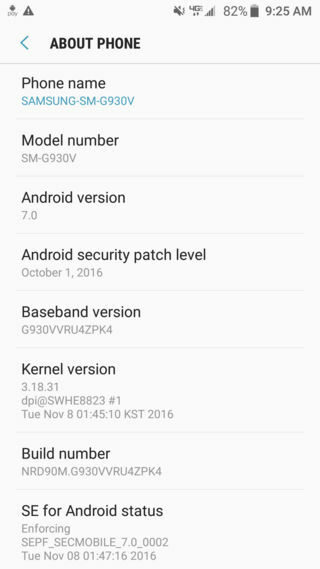 The Nougat Beta listed below comes with firmware build G930VVRU4ZPK4. The newer update brings QB1 build. The update.zip files are OTA updates that can be installed using the stock recovery and not a custom one. As these are OTA updates, it can installed using both ADB sideload method as well as SD card method. We have listed the SD Card method here. For ADB sideload method, visit this page. OTA 1: For S7 devices running on PH1 firmware, download and rename this S7Nupdate.zip files to update.zip and follow the instructions below. OTA 1: For S7 devices running on PI3 firmware, download and rename this PI3_PK4update.zip file to update.zip. OTA 2: This is the latest update 2. Install update 1 and then download this S7update2.zip and go through the same procedure. then download the 2nd OTA file. How to update Verizon Galaxy S7 (Edge) to Android 7.0 Nougat firmware? Note: Make sure your SD card is not encrypted or you may encounter errors. Samsung Galaxy requires 2 update files. Install both the update files one after another from the stock recovery. Troubleshooting: If came across – “E: footer is wrong” error followed by “E: signature verification failed”, Decrypt SD Card and try again. Download all the necessary files for the S7 device and transfer required files to SD Card in fota folder. Reboot into download mode or Odin mode. To do so, turn off the device completely. Then press and hold Power off + volume up +home keys simultaneously. Also, make sure phone says Official under system and binary. If it does not, then you must flash the full stock firmware G930VVRS4APH1 file via Odin. Once the S7 device is complete stock, reboot into the system. Enable developer options from Settings. To do so, go to Settings>About Phone>Tap on Build number several times. Go to Developer options and Turn the OEM unlock to OFF. You can enable it after the update. Also, Enable USB debugging from Developer options. Now transfer the update.zip on External SD Card in a folder named fota. Turn off the phone and check the system and binary for the official status. After you get the official status, Reboot device to recovery. (Power + volume down + home). Now, choose to apply updates from SD card. locate the Update.zip from the fota folder. Tap on yes to apply. Do the same for the OTA 2 file. Once the update procedure is complete, reboot to system. Enjoy the new Android 7.0 Nougat firmware update. Hello, thanks for this guide, i’v e check a lot of times and there’s no OTA for me yet, i’m currently ouside the US, maybe this is the reason. My question is, i haven’t find the fota folder in my internal storage, so, can i create one? Hi guys! Thanks for the great write up. I’m curious: do you know if it’s possible to flash the SM-G935V firmware onto the SM-G935U? Thanks! I’ve download the OTA1 AND OTA2 but when i extracted it, there are so many files. which of those should i use? OTA means Over The Air. The files are copies of the official updates. You don’t want to extact them. You just need the zip files. This update file fails on my SM-G935V with GSM unlocked. Any help would be appreciated. It sez that the firmware version is not what was expected. Booting into recovery mode is Home + Power + Volume Up, not Volume Down.